The system wide network configuration file is /etc/network.conf. 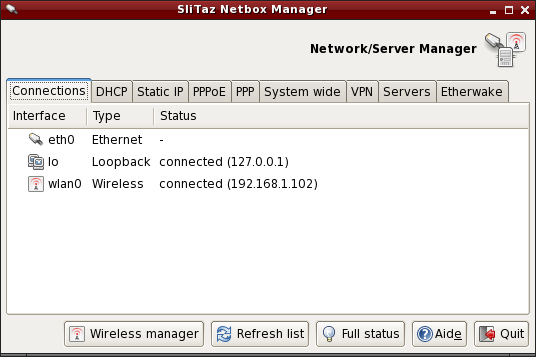 It can be graphically configured at the Network tab on SliTaz Panel or directly edited by the root administrator. Netbox is a small GTK+ application to configure a network interface using DCHP or a fixed (static) IP address. The tabs can be used to start/stop the connections and automatically change the values in the system files. Netbox provides a system wide tab from which you can directly edit network configuration files, and tabs to configure PPP/PPPoE username/passwords. Servers such as SSH, DHCP, PXE, DNS, etc can also be configured and it's possible to create your own virtual private network (VPN) using the tools provided. 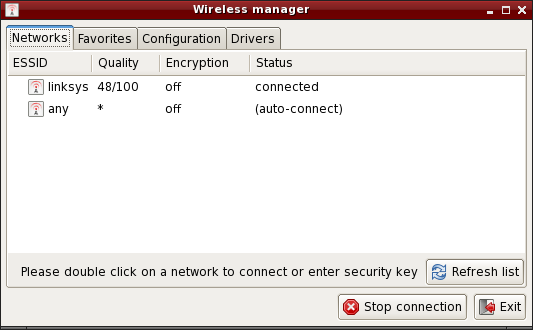 Wifi-box is small interface to configure a network connection (Wifi, WLAN, or Wireless). The 'Networks' tab displays a list of available networks, just double click on a network name to connect. If the network is secure, the key will then be sought. The card is supported directly by the kernel via a module. The card needs a module and non-free firmware that can be installed automatically via the auto-detect tool (tazhw). The card is not supported by Linux and a Windows driver must be installed via the Windows driver manager (tazndis). /etc/network.conf is the SliTaz system network configuration file. It's syntax is simple and you can edit its contents with a text editor such as Nano. /etc/network.conf is used by the script /etc/init.d/network.sh to configure the network interface at boot time. Enter your username, please note that this is the username with which you communicate with your ISP. Internet interface, default is eth0 unless you have more than one, in which case you will have eth1, eth2, etc. Usually the Enter key is sufficient. If you have a permanent ASDL link answer yes, otherwise answer no (default). Specify the primary and secondary DNS your ISP uses (you may have to ask). Enter the password with which you communicate with your ISP (you need to enter it twice). Choose the firewall settings depending on your hardware. If you have a router you can enter 1 or 2. If in doubt enter 1. On an installed system you just need to add the module_name to the variable LOAD_MODULES in /etc/rcS.conf to load your module on each boot. SliTaz provides a very basic firewall, the kernel security rules are launched at boot time and iptables rules are disabled by default. You can activate/disable these at startup by using the configuration file /etc/firewall.conf. The default firewall script begins with its own set options for the Kernel ie. ICMP redirects, source routing, logs for unresolved addresses and spoof filters. The script then launches the rules defined in the iptables_rules() function of the configuration file: /etc/firewall.conf. The firewall uses Iptables, it consists of two files: /etc/firewall.conf and /etc/init.d/firewall, you shouldn't need to modify these. Note Iptables has lots of options. For more infomation see the official documentation available online: http://www.netfilter.org/documentation/. At the bottom of the configuration file: /etc/firewall.conf, you will find a function named: iptables_rules(). This function contains all of the iptables commands to launch when the firewall starts. To delete a rule, It is advisable to comment out the corresponding line with a #. It is not advisable to leave the function completely empty, if you want to disable the iptables rules just add “no” to the variable IPTABLES_RULES= in the configuration file. Here's an example of using iptables rules. It only allows connections on the localhost and the local network, and ports 80, 22, and 21 used by the web server HTTP, the SSH secure server and FTP respectively. All other incoming and outgoing connections are refused, so it's fairly restrictive.